Adults only holidays in Lanzarote are becoming increasingly popular for parents whose kids have flown the nest and for younger couples who want to enjoy a quieter, more grown up holiday. 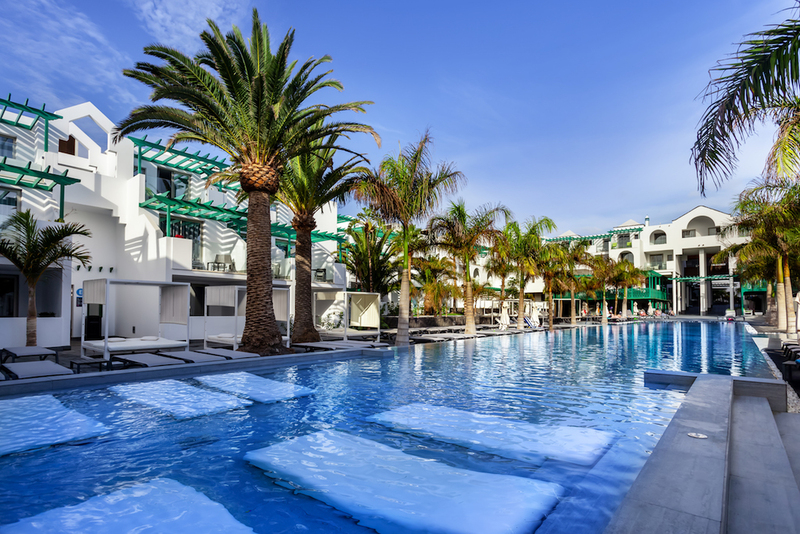 The Barcelo Teguise Beach hotel is a 4* situated on the seafront of Costa Teguise and just 150 meters from Playa Las Cucharas. This modern hotel is for 18 year olds and above and almost all of the 305 rooms have a hot tub either inside the room, or on the terrace. Guests have two freshwater infinity pools to chose from at this stunning hotel and for those seeking the ultimate in relaxation the spa offers a variety of great treatments. Those looking to get their adrenaline pumping are also well catered for with a full gym, which boasts a cardio area, a free weights area and a number of exercise classes are timetabled. There is daytime and evening entertainment available, including live music shows. Guests have 6 beautifully designed rooms or suites to chose from, all of which have tasteful furnishings and some provide stunning sea views. The buffet restaurant displays some cracking show cooking in the evenings, and there is a lobby bar, a pool bar and a sports bar to enjoy. Guests can chose from a Half Board or All Inclusive stay at The Barcelo Teguise. The 4* Sentido H10 White Suites has an enviable location between the charming Playa Dorada beach and the shopping area in the elegant resort of Playa Blanca. This contemporary hotel is for 16 year old’s and above and all of the 200 suites have the typical amenities you would expect to find in a sophisticated hotel. Guests have two freshwater outdoor pools to chose from, both are surrounded by sunbeds and parasols and one is heated from November through until April. There is a gym which concentrates on cardio fitness, a sauna, a steam room, a whirlpool, a spa which offers some fab treatments and a Turkish bath. Daytime and evening entertainment are provided during the busier seasons. The gastronomy at the White Suites is fabulous, with show cooking at breakfast, lunch and dinner as well as a pool bar, the Blue Bar which is situated in the gardens and a lobby bar. Guests are able to book a Bed & Breakfast, Half Board or All Inclusive stay at the White Suites. The Isla de Lobos Apartments are situated in the bustling resort of Puerto del Carmen and they are located around 150 meters from the magnificent Playa Grande beach. This small development of 26 1 and 2 bedroom apartments is for 18 year old’s and above. All of the apartments come equipped with an en suite bathroom with shower, an open plan kitchenette with oven, microwave, coffee maker and everything you need to be able to enjoy the self catering experience. Each apartment has a terrace or balcony and most have views over the pool and garden area. A maid service is available offering a change of towels as required and a weekly change of bed linen. Guests can enjoy the outdoor freshwater pool, poolside snack bar and relax and unwind on the sunbeds and under the parasols. It’s fabulous location means that guests are minutes away from a variety of shops, restaurants and bars. The hotels and apartments we have highlighted are just a small selection of the adults only locations available in Lanzarote.